It’s been a long while since I’ve posted. It isn’t because I have nothing to post about! I’ve just been sooooo busy. This is the first year I’m teaching Geometry, and I’m working with the other teacher to turn it on it’s head. Completely. We haven’t cracked the textbook yet. I want to share one activity that I thought was not only was engaging, but led to really interesting discussions in my classroom. This is actually really challenging. 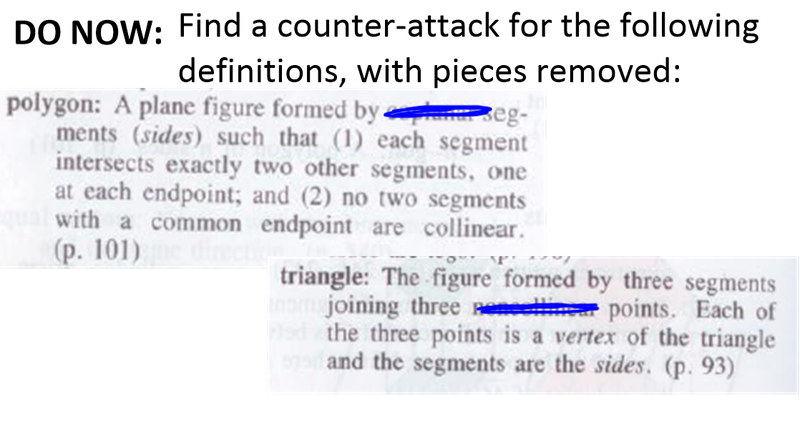 I mean: you yourself, try to define a triangle without looking it up, or even more challenging, a polygon. Before starting, groups were told that other groups would try to find fault with their definitions, so they should be as specific and clear as possible. Each group then passed their three definitions to a different group. And that new group was tasked with finding a counter-attack to these definitions. What this means is they needed to draw something that satisfies the definition they were given, but is not a circle (or triangle, or polygon). Those trying to counter-attack were allowed to read the definitions they were given in any way that seemed reasonable to them. We then had a class discussion. Students publicly posted their group’s definitions (they were written on giant whiteboards), and then those with counter-attacks were allowed to present them to the whole class. When the counter-attacks were presented, it was interesting how the discussions unfolded. The original group often wanted to defend their definition, and state why the counter-attack was incorrect. Then a short spontaneous discussion would occur. At the end of the discussion, I found myself often being arbiter and passing judgment on each counter-attack: “yes, this counter-attack works, because …” or “no, this counter-attack doesn’t work, because…” I felt the kids needed to know (a) whether the counter-attack really did satisfy all parts of the group’s definition, and (b) whether the counter-attack was using a fair reading of the group’s definition. When I said the counter-attack was valid, the group who found the counter-attack was elated! And when I said the counter-attack was invalid, the group who wrote the definition was elated! It became a bit of a spontaneous contest. What was awesome was the subtleties they ended up talking about when trying to find the counter-attacks. When talking about the circles or polygons, for example, they realized that we have to say this is a 2D figure, otherwise there are many other curves that would work. When talking about triangles, saying the figure had three angles was problematic because there are 3 interior angles and 3 exterior angles. 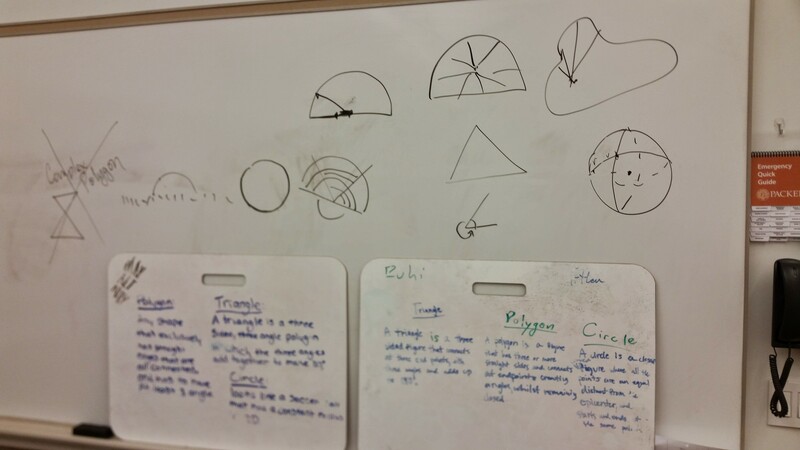 For triangles and polygons, students realized how crucial it was to say that the figures were closed. I was so impressed with how they were really trying to attend to precision in this task. Eventually, we looked at a textbook’s definitions for these three words. It took us a while to understand these definitions, and why the particular language was chosen. 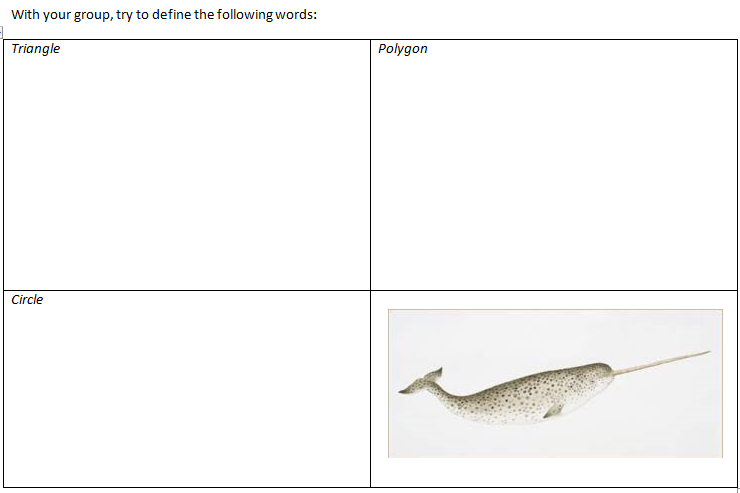 The polygon definition was especially challenging — especially the second half! Although I thought this would be easy for them, it was interesting to see that they found this challenging and abstract. The ending of our first unit involved students coming up with their own definitions for the bunch of quadrilaterals (kite, dart, square, trapezoid, rectangle, rhombus, convex quadrilateral, concave quadrilateral, isosceles trapezoid, parallelogram). This opening activity was designed to make that exercise easier when we got to there. Specifically, it was designed to show them that clear and precise language is important to communicate your ideas, and it isn’t easy to come up with clear and precise language. Things that we “think we know” are really quite hard to pin down… Like what a circle, triangle, and polygon are. UPDATE: I found some examples of “counterattacks” that my kids drew for various definitions, so I figured I’d scan them in for posterity… We came up with more when we were having our discussion. I’m finding this to be a really rewarding thing to have sprinkled in. 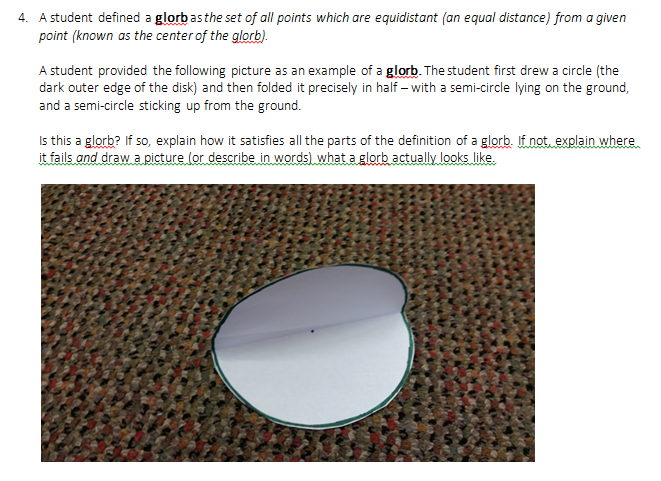 I’m learning it’s challenging for students to be able to try to make a potential conclusion from a number of examples. But in fact, isn’t that a crucial skill in mathematics? We see a number of examples of something, we decide on a very plausible conjecture, and then we try to reason out why that conjecture is true (or come to realize it isn’t true)? Interestingly, I am reading the biography of HSM Coxeter right now, I think he would be thrilled to know that Geometry is alive and (at least in one classroom) being taught in a way that inspires future geometers. I had a thought about the inclusion of “from a point in the plane” in the definition of circle. It doesn’t seem to be needed for the circle, as long as the points determining the circle are all coplanar. The restriction is only for enabling them to include definitions of center and radius. I know the typical course at this time of year is totally into Euclidean Geometry of the Plane, but my first thought on reading the definition of polygon was of a lune on a sphere, the beautiful bi-gon. Thank you for your comment! I don’t know about “inspiring future geometers” (I’d give the course a B-/B right now… but it’s my first year doing it! And we’re building it from the ground up! So I’m okay with that.) But I do hope it gets them thinking. Your observation about the circle is spot on! What is the Coxeter biography? Is it compelling or dry? I always like a good math book! Trusting that it’s Siobhan Roberts’s King of Infinite Space: Donald Coxeter, the Man Who Saved Geometry then it’s a book I read earlier this year and enjoyed greatly. Indeed, I got two pretty nice blog posts out of asides in it — a proof about trisecting the angles of a triangle for one, and the search for inefficient sphere packings for another. Since our courses change completely at the end of the semester, I am thinking of using this activity to start the new course in January. Thank you! 1) I would be very curious about what “traces of evidence” you find later in the semester about how this experience has affected students’ thinking and their ways of being in the classroom. For example, does it seem to affect how they decide on the truth of statements or who they look to for verification? Hihi. As for #1, I can say I’ve already seen kids really thinking about the meaning of statements and reading them carefully. But I will try to keep an eye out to see if evidence of the use of this exercise pops up concretely. I’m guessing that what I’ll end up seeing will be less visible (as you probably do to, from your phrase “traces of evidence”). I, too, am concerned with vocabulary. When we deal with a word or term, I like to work with some examples first and have the students come up with a “working” definition they can agree on, then we refine as we learn what fits and what doesn’t. I like the way you have asked the groups to create examples that fit the definition but shouldn’t. You have given a great way for me to enhance our activities with the vocabulary!